Once man begins to interfere with the natural order of our world, it's hard to set things right. Thursday, I "toured" the Indian Lakes wild horse pens at Fallon again. The saddest thing I saw was a lone mare in the nursery pen. She stayed apart from the others, against the fence. Of all the horses there, she was the only one without a foal. Her baby had been delivered into the hands of wild horse angel Shirley Allen, because of its failure to thrive. The foal is in good hands. The foal is among other babies with wild bloodlines. I have every confidence that the baby will live. But the grieving mother knows none of this. Even when a hailstorm pounded Indian Springs and the captive wild horses clustered together in the corrals - heads in, tails out toward the storm -- she stood alone. Was she waiting for her baby? Did her mother mind just know something was amiss? These horses belong on the range, on their homeland. Even when BLM does what's right, it somehow feels so wrong. My morning has brought a brighter view of things. First, the judge did not side with BLM ; he dismissed our case. It's not the same thing and it IS much better for the horses and for those of us who have just begun to fight. b) the part of our case that said we the plaintiffs (acting for you and the horses) said we would be damaged by taking of the horses from the range, didn't SPECIFICALLY say we'd all be damaged by mustangs being moved to long-term holding. To me, it was like saying if a thief had already burst through my front door despite my protests and dogs, he'd earned the right to rob me. But I'm no attorney and the truth is, the judge left us possibilities to sue BLM for illegal long-term holding of our horses, cruelty, etc. Am I giving up? NO WAY. I have awful news: the Calico horses will not be returning to their homeland. Judge Friedman ruled against IDA, Craig Downer, me, the horses and everyone who cares about the wild ones. There may be hope for other mustangs, but things look bleak for the Calico herds. I don't know if I've ever been so disheartened by BLM. 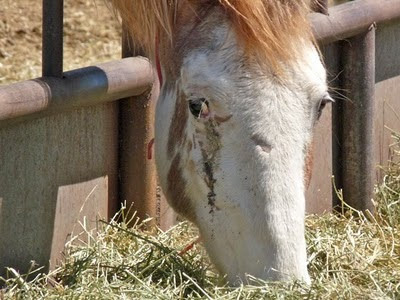 Carelessness and cruelty amount to the same thing when a tiny foal starves to the brink of death. Then, because life is cheap at Indian Lakes ranch in Fallon, Nevada, his "protectors" kill him. I won't post the foal's photo here. A better memorial is for us to imagine his spirit roaming free beside another of his kind. I won't apologize for living amid a whirlwind of writing and wild horse activity, but I am sorry my "monthly" newsletter is off schedule. Those of you who've already subscribed are among nearly 3,000 horse and book lovers waiting for me to get it together! The Phantom is a fun, informative e-newsletter designed with my readers in mind. It's filled with the latest book news (like the German WILD HORSE ISLAND books, above), wild horse updates, booksigning and appearance dates, photos, artwork and more. That takes you to the sign-up page to type your email address in a little window. Biggest ever Q & A session --- Coupon for readers going to the Western States Horse Expo --- Mustang photo gallery -- Sam's blog --- more! 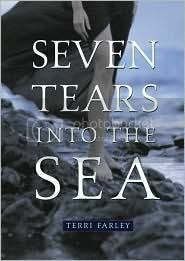 SEVEN TEARS INTO THE SEA's cover has fascinated readers from the start, and after my Saturday post, I heard from more of you. Although I don't know who designed the current cover (I gave away my last copy of SEVEN TEARS earlier this week! ),I do know the cover did not start with the photo art. Gwen of SEVEN TEARS INTO THE SEA has a history of sleepwalking and both covers consdered showed Gwen walking at midnight to the place where the sand meets the sea. Above, you'll see the original artwork considered for SEVEN TEARS' cover. It was painted by the talented LeUyen Pham. Authors are rarely allowed to choose the covers for their books. In this case I'm glad, because I love them both. 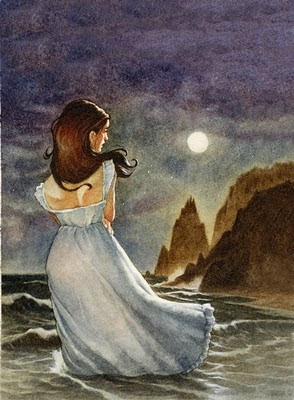 You must be longing for summer breezes, because a rising tsunami of letters and email are coming ashore, asking me to chat about SEVEN TEARS INTO THE SEA. I loved writing my only fantasy and its setting haunts me, too. Many of you have asked for a sequel, but I'm not there yet. That doesn't mean I can resist the sea songs of another bit of Celtic mythology, but it's still spinning itself into words. Click here to Be the first to start a discussion! the sea is calling -- enjoy! The Cloud Foundation is pleased to announce “Herd-Watch,” a dedicated public observation effort of our American herds of wild horses and burros across ten Western states. Dedicated volunteers are needed for this effort both on and off the range. HIGH SCHOOL STUDENTS AND TEACHERS CAN HELP! 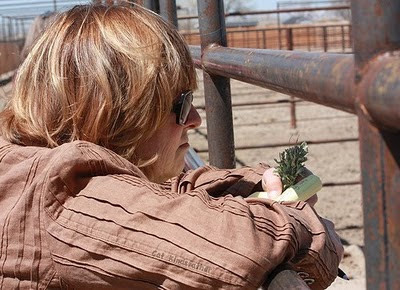 In the lifeless sand of the Fallon feedlot, friendship blooms between two once-wild mares. I hope they're soon BFF on the wild range, but for now they have human names honoring the Paiute lands on which they were captured. Shell Flower is the English translation of the Paiute name Thocmetony. I hope you'll do a bit of research and learn the story of the great woman for whom Ghost Dancer's pinto pal is named. I still want to write a book about the first (human) Shell Flower. This wonderful poem was written in response to my earlier blog post, "Sagebrush Prayer". It was hidden in the responses, and I wanted to be sure you had a chance to read and enjoy it. T.
She came to the field as she did every year. In her tattered jeans and hand-me-down boots. She turned left and right, not a herd to be heard not a filly to be found. Year after year they came to eat the sage off her fingertips, fewer came every season, those velvety lips..
And she stood silent, a sage with dying sage, and she knew. Summer job with wild horses? Are you 15-24 years old? Do you have a passion for the Mustang? Could you use some extra cash this summer? APPLY TODAY for a job opportunity offered through the Mustang Heritage Foundation! Become a Mustang Representative, a Mustang Apprentice or a Mustang Camp Counselor! Get paid to learn more about the history, characteristics and plight of the American Mustang and share this knowledge with others through an awareness campaign that includes press releases, social networking (facebook, twitter, etc.) and community presentations. Mustang Apprentices will create a business plan for their personal horse training business, and Camp Counselors will assist in the planning and implementation of wild horse camps. For more info visit www.mustangheritagefoundation.org. I'm on my way out to Battle Mountain, Nevada today and I'm excited. Not only will I be teaching four writing workshop for junior high students tomorrow, but I'll be traveling across Nevada's amazing basin and range. From this photo, you can see how the land is like corduroy, alternately mountainous and flat. It's good wild horse country and I'll keep my eyes open. Storms are brewing and the clouds look like bulging gray muscles before the winds puff them into white mare's tails, then scud them away. I'm traveling with my friend Suzy (Suzanne Morgan Williams, author of BULL RIDER, now out in paperback btw)and she loves wild Nevada as much as I do. We'll have the windows open to smell the storm-hammered sage. p.s next school visits -- Orlando, Florida! The orphan foal rescued last week is fitting into his human herd just fine. Don't you want to cuddle him? This isn't the first time I've shown you a photo of this beautiful Medicine Hat mare from the Calico Mountains, but it's certainly the worst. I'm going out to BLM's Fallon facility to check on her today. YAHOO! Answers is compiling names of horses in the PHANTOM STALLION and WILD HORSE ISLAND books. Last time I checked, there were only fifteen. Some of them were horses which hadn't galloped across my imagination for a while and I was delighted to "see" them again. I wonder how many horses really live in my fictional herd? What are the Names of Terri Farley's horses? Today's National Day of Prayer coincides with BLM's courtroom face-off with the legal team for the Calico mustangs. Many of us will be holding up the horses, Judge Friedman and the legal team in our thoughts and prayers. We also hope for a last-minute change of heart from Secretary Ken Salazar. No matter your faith, consider wrapping them all in your caring. The last time I went to BLM's corrals, photographer Cat Kindsfather brought along a bouquet of sagebrush to share with the wild horses, so that they could smell their homeland even if they couldn't see it. They noticed. They came closer. We reached out to the with our hearts. I know you'll love watching the rescue of this wild horse foal! The foal's mother died and his sire tried to care for him (they're together, in the photo above) but the little guy needed mother's milk, so humans from Least Resistance Training and others in the Stagecoach area helped out. Click his new name: IRON MAN to see the TV newsstory. Ed Pearce, the reporter who did several TV stories on the real Phantom Stallion was clearly delighted by Wild Horse angel Shirley Allen and her new house guest! Heather is not only a friend, but a former student and she made me so happy today. IF you haven't read the absolutely brilliant book, SEVEN TEARS INTO THE SEA by Terri Farley, your first question should be, WHY DO I HATE MYSELF SO MUCH?!?! If you'd like a visual and empathetic view of the Calico horse experience, please explore this blog site.